Taking Ideas into ActionKim Jin-heung, the CEO of "CUP EYE"
Nowadays, people can see advertisements on a wide variety of media including television, radio, and through mobile applications. Online adverts, in particular, are easily recognizable if they are eye-catching. However, it is difficult for people to remember offline advertisements in daily lives which appear on buses, subways, and banners across buildings. “CUP EYE,” an advertising start-up company, has been lauded in Korea as a company that overcame the limitation of offline advertisements, particularly among companies targeting university students. CUP EYE’s unique strategy of promoting products is simple: cup holders. Witty slogans and promotions are written on cup holders at campus coffee shops. 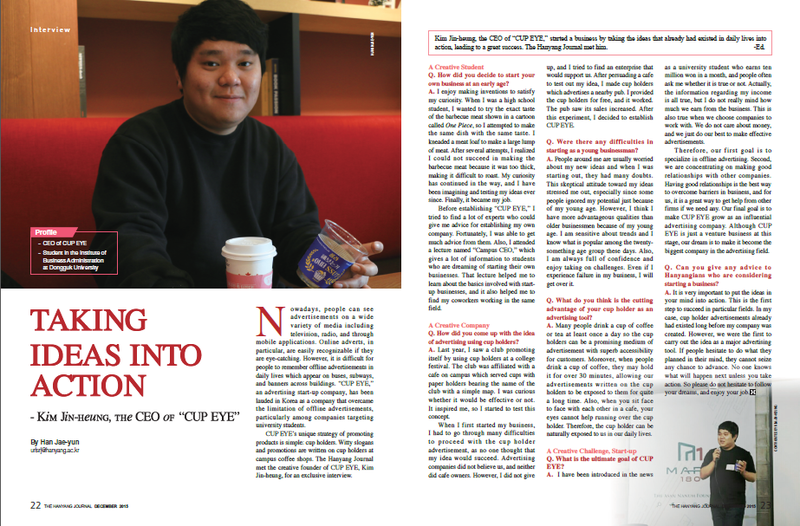 The Hanyang Journal met the creative founder of CUP EYE, Kim Jin-heung, for an exclusive interview. Q. How did you decide to start your own business at an early age? A. I enjoy making inventions to satisfy my curiosity. When I was a high school student, I wanted to try the exact taste of the barbecue meat shown in a cartoon called One Piece, so I attempted to make the same dish with the same taste. I kneaded a meat loaf to make a large lump of meat. After several attempts, I realized I could not succeed in making the barbecue meat because it was too thick, making it difficult to roast. My curiosity has continued in the way, and I have been imagining and testing my ideas ever since. Finally, it became my job. Before establishing “CUP EYE,” I tried to find a lot of experts who could give me advice for establishing my own company. Fortunately, I was able to get much advice from them. Also, I attended a lecture named “Campus CEO,” which gives a lot of information to students who are dreaming of starting their own businesses. That lecture helped me to learn about the basics involved with startup businesses, and it also helped me to find my coworkers working in the same field. Q. How did you come up with the idea of advertising using cup holders? A. Last year, I saw a club promoting itself by using cup holders at a college festival. The club was affiliated with a cafe on campus which served cups with paper holders bearing the name of the club with a simple map. I was curious whether it would be effective or not. It inspired me, so I started to test this concept. When I first started my business, I had to go through many difficulties to proceed with the cup holder advertisement, as no one thought that my idea would succeed. Advertising companies did not believe us, and neither did cafe owners. However, I did not give up, and I tried to find an enterprise that would support us. After persuading a cafe to test out my idea, I made cup holders which advertises a nearby pub. I provided the cup holders for free, and it worked. The pub saw its sales increased. After this experiment, I decided to establish CUP EYE. Q. Were there any difficulties in starting as a young businessman? A. People around me are usually worried about my new ideas and when I was starting out, they had many doubts. This skeptical attitude toward my ideas stressed me out, especially since some people ignored my potential just because of my young age. However, I think I have more advantageous qualities than older businessmen because of my young age. I am sensitive about trends and I know what is popular among the twentysomething age group these days. Also, I am always full of confidence and enjoy taking on challenges. Even if I experience failure in my business, I will get over it. Q. What do you think is the cutting advantage of your cup holder as an advertising tool? A. Many people drink a cup of coffee or tea at least once a day so the cup holders can be a promising medium of advertisement with superb accessibility for customers. Moreover, when people drink a cup of coffee, they may hold it for over 30 minutes, allowing our advertisements written on the cup holders to be exposed to them for quite a long time. Also, when you sit face to face with each other in a cafe, your eyes cannot help running over the cup holder. Therefore, the cup holder can be naturally exposed to us in our daily lives. Q. What is the ultimate goal of CUP EYE? A. I have been introduced in the news as a university student who earns ten million won in a month, and people often ask me whether it is true or not. Actually, the information regarding my income is all true, but I do not really mind how much we earn from the business. This is also true when we choose companies to work with. We do not care about money, and we just do our best to make effective advertisements. Therefore, our first goal is to specialize in offline advertising. Second, we are concentrating on making good relationships with other companies. Having good relationships is the best way to overcome barriers in business, and for us, it is a great way to get help from other firms if we need any. Our final goal is to make CUP EYE grow as an influential advertising company. Although CUP EYE is just a venture business at this stage, our dream is to make it become the biggest company in the advertising field. Q. Can you give any advice to Hanyangians who are considering starting a business? A. It is very important to put the ideas in your mind into action. This is the first step to succeed in particular fields. In my case, cup holder advertisements already had existed long before my company was created. However, we were the first to carry out the idea as a major advertising tool. If people hesitate to do what they planned in their mind, they cannot seize any chance to advance. No one knows what will happen next unless you take action. So please do not hesitate to follow your dream, and enjoy your job.